Most mountaineers are aware of the importance of the large muscles in the glutes, quadriceps and hamstrings for propelling you up and carrying you down hills in alpine climbing, scrambling, and hiking, as well as snowshoe and glacier travel. Rock and ice climbers are likely to spend more of their time training for grip, forearms and back strength. But what do all of these diverse groups have in common? A need for strong and flexible ankles and calves! This month we take a closer look at training suggestions to help you keep your lower legs, ankles and feet ready for spring and summer adventures. In order to determine whether you need to pay more attention to your ankles, calves and shins, try the following three “tests.” 1) First, attempt the Frog Stretch below. If you feel really tight in the front of the shins (particularly in the muscle called the anterior tibialis) or you have trouble keeping your heels on the floor, you may benefit from stretching your calves. Try several of the stretches we’ve included in the next section. 2) If, after you stop hiking or climbing, you notice that your calves cramp or become excessively tight, try stretching after your activities and regularly during the week. 3) Assess your own performance--if you a) have trouble sinking your heels down for friction moves, b) have difficulty traversing steep snow or ice while wearing crampons because your ankles just won’t “go” that way, or c) can’t quite get your feet to move the way you want for foot or toe jams, the answer may be as simple as 5-10 minutes of targeted active stretching. Hang onto a railing or wall near a block, box or step. Place one foot on the step with the ball of the foot on the edge (rather than the toe, as shown in the picture). Drop your heel and contract the glutes until you feel a good stretch in the back of the entire leg. Hold 20 seconds, and then repeat to the other side. If you notice that one calf is much tighter than the other, stretch the tighter side first, and either hold longer on that side or stretch twice. Stand with your feet about 18-24 inches apart (a little wider than shoulder width) and squat down as low as you can while keeping your heels on the floor. Press your elbows against the knees to increase the stretch in your hips and inner thighs. If you have trouble keeping your heels on the floor, you can use a plate or 2x4 under the heels but ONLY until you have increased your flexibility to the point where you can keep your heels flat. Keep your torso as upright as possible. This stretch is a “must” for any crag, gym or rock climbers so that you increase your calf and hip flexibility for vertical routes. 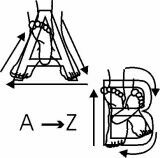 One way to increase ankle flexibility in all directions (also useful in post-rehab to regain normal range of motion) is to perform ankle circles or draw the alphabet with your toes. There is no need for excessive movement through the knee; simply move the toes and pivot at the ankles. Find some sort of a solid surface that can be tilted at varying degrees (10-45 degrees) in order to mimic the type of terrain you’d have to traverse during your climbs. The easiest way to do this might be to find a hillside in town that has several slopes of varying steepness. In Seattle, the Ballard Locks area comes to mind. Try practicing the duck walk, pied a pointe, pied assis and other crampon techniques that require more ankle flexibility than you may currently have. You can practice in your boots, barefoot, or in regular shoes, depending on the season and your personal preference. Realize that boots won’t afford quite as much flexibility as the other options, but they are, after all, what you’ll be wearing to climb. Walking up and down, face in and out, and traversing under a controlled environment at first, with several minutes a day of active stretching (rather than simply holding your ankle in one position, known as static stretching) you may find that you will be a lot more comfortable and better prepared when you start to head out to the mountains. If you can actually get out to the mountains for targeted crampon practice several weeks prior to your climbs, not only will you be able to prepare your ankles and calves, but practice can also lead to improved technique and familiarity with equipment. No picture required; this is exactly as it sounds and provides a great training alternative for those who live and train in hot areas. Find a coarse gravel pit or take a walk on a beach where there are plenty of steep sand dunes. Walk up and down the dunes to simulate climbing and down climbing, facing into and out of the dune, and going across, up and down at varying angles. The “give” of the dunes will simulate the “give” of slushy snow as you come down from a glacier climb mid-day after the sun has begun to melt the top layer of snow and ice. Climbing a dune when it’s raining will simulate walking up and down an icier slope, as the rain will help the sand grains adhere to each other more easily. Try it in bare feet (unless for some reason you have been told by a sports medicine professional not to go barefoot). As always, of course, the best way to train for ankle stability and flexibility is to get out there on your climbs in early season and get lots of experience. Perhaps you feel you need more strength in the muscles in your feet and calves. How can you be sure? Obviously, if you have had some lower extremity injury (including but not limited to ailments such as plantar fascitis, an Achilles tendon strain, a sprained ankle, or a broken or fractured bone in the foot), you are most likely already aware of any noted weakness. Elliptical machines provide a suitable training option for non-impact lower extremity rehabilitation--they allow you to continue with your aerobic training, while requiring very little movement through the feet or ankles. Once your injury has healed, the next goal would be to regain the strength in your weaker leg or foot and resume uneven terrain training. If, on the other hand, you haven’t been injured, but you notice that your non-dominant side is significantly weaker than your dominant side, then single-limb strengthening exercises may help. Furthermore, if you are healthy but you spend a lot of time on a fixed foot plate machine such as an elliptical cross-trainer, you will definitely want to supplement such training with uneven terrain work. Try this simple test of balance: stand on one leg and squat down or bend over to touch the floor. If you feel “weak in the ankles,” or you topple to one side or the other, try some of the following strength moves. Position yourself as for the Standing 1-Leg Calf Stretch, but hold a substantial dumbbell in the hand of the leg you will be working. Place the other foot behind the ankle and hold on to a railing or wall. Exhale as you lift, inhale as you lower and pause in the lower stretched position for a second or two. Work within the 6-20 reps range, depending on whether you’re in a strength cycle (6-10 reps) or endurance/rehab cycle (10-20 reps). Begin with the non-dominant or weaker side first and only complete on the strong side as many as you can successfully complete, with proper form, on the weak side. Use a safety bar (pictured) with an appropriate amount of weight. If you do not have access to a bar that allows you to keep your arms free to hold on, you can also try loading a substantial amount of weight in your backpack (30 or more pounds) or use a Nautilus-type straight-leg calf raise machine or a Smith rack. Choose whatever option will allow you to have as much range of movement as possible without restriction. Use a light weight plate, theraband, surgical tubing or manual resistance (such as your own or a friend’s hand) for this next exercise to strengthen the muscles in the front of the shins. If you tend to suffer from what some people refer to as “shin splints” when you try to race walk, of if you have suffered from any sort of nerve damage that makes it more difficult to pick up the toes during exercise, then you may benefit from training the anterior tibialis for endurance (i.e. use light weight for many repetitions). Use a stiff-toed boot if you intend to use anything more than about 5 pounds, so that you don’t hurt a toe. 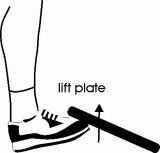 If using a band, tie one end to a vertical rod or even a chair leg and pull your toes toward you. To increase resistance, simply move back farther from the attachment surface. Work up to doing this for 2 minutes at a time. Stand balanced on one foot with a dumbbell in each hand. Keep the other foot in the air but near the floor in case you need to touch it down for balance. Bend over to touch the floor with as much or as little knee bend as is comfortable for you. Most of the flexion will be through the hips, rather than at the knee. Exhale as you lift back up to standing. Repeat to the other side. As with any injury, your best bet before starting any aggressive rehabilitation program is to see a physical therapist or a sports medicine doctor for appropriate suggestions specific to your needs. If you have been released from such therapy and are on your own to regain the remainder of your strength, we would be happy to help direct you toward further recovery. Contact one of us at trainer@bodyresults.com for more information.